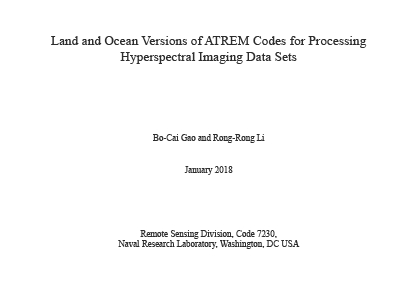 At the core of the PACE mission is an advanced optical instrument, the Ocean Color Imager (OCI), designed to provide hyperspectral ultra violet (UV), to visible (VIS) and near-infrared (NIR) and multi-spectral short-wave infrared (SWIR 1.0 - 2.5 micron) observations of the earth ecosystems. 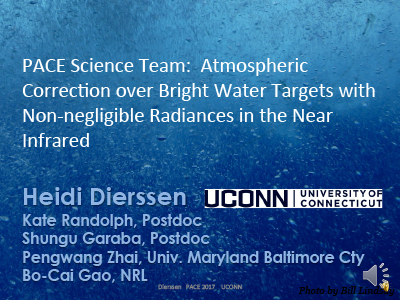 We propose to join the PACE Atmospheric Correction team, to work together with other team members in developing hyperspectral and multispectral atmospheric correction algorithms to retrieve water leaving reflectances from OCI radiance measurements. 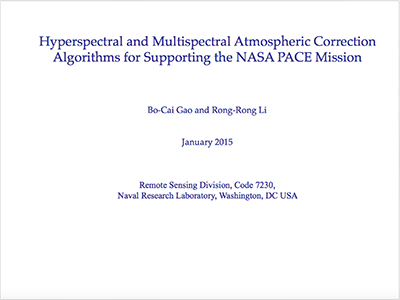 We have extensive experience developing atmospheric correction algorithms. 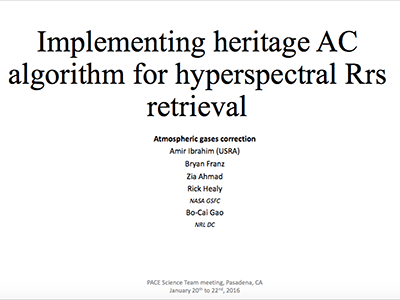 In early 1990s, we developed the first model-based land version of hyperspectral atmospheric correction algorithm (nicknamed ATREM) (Gao et al., RSE, 1993) to support the NASA HIRIS (High Resolution Imaging Spectrometer) Project. 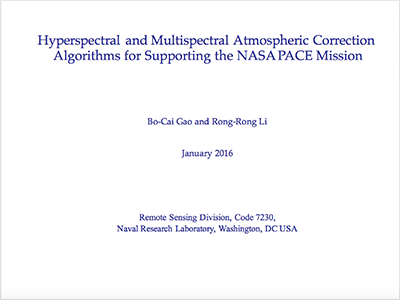 In late 1990s, we developed an ocean version of hyperspectral atmospheric correction algorithm for the Navy (Gao et al., Applied Optics, 2000), which was based on Robert Fraser's formulation (Fraser et al., JGR, 1997). 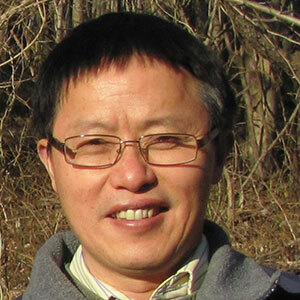 In early 2000s, with funding support from the NASA SIMBIOS Project, we modified the ocean version of the hyperspectral atmospheric correction algorithm, and developed a MODIS version of multi-channel algorithm for remote sensing of water leaving reflectances over turbid coastal waters (Gao et al., IEEE TGRS, 2007) from a combination of MODIS land and ocean channels. A SWIR spectrum-matching technique using MODIS channels centered at 1.24, 1.64, and 2.13 micron was used to estimate aerosol models and optical depths. More recently we developed a VIIRS version of coastal water atmospheric correction algorithm. The VIIRS channels centered at 1.24, 1.61, and 2.25 micron with proper modeling of atmospheric CO2 and CH4 absorption effects and a SWIR spectrum-matching technique were used for atmospheric corrections. Over the past 6 years, we have supported the HICO (Hyperspectral Imager for Coastal Ocean) Project. We developed the L1B software for converting raw digital numbers to L1B radiances with proper consideration for instrument artifacts, such as spectral smear and second order light. We developed spectrum-matching algorithms for refining HICO wavelength calibrations and for monitoring the stability of the HICO instrument with time. 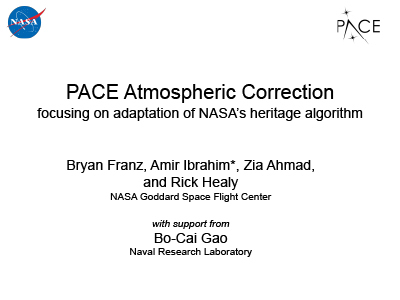 We developed a functional version of atmospheric correction algorithm for processing HICO data. 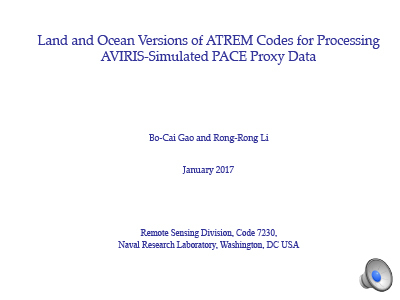 Here we propose to use our experience in hyperspectral and multi-channel algorithm development and in analysis of AVIRIS, MODIS, VIIRS, and HICO data, to help the development of atmospheric correction algorithms for processing PACE OCI data, and support the spectral and radiometric calibrations of the hyperspectral portion of the OCI instrument. 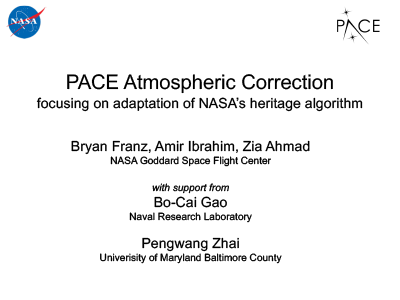 We would work together with other PACE atmospheric correction team members for the design and implementation of a consensus OCI atmospheric correction algorithm.